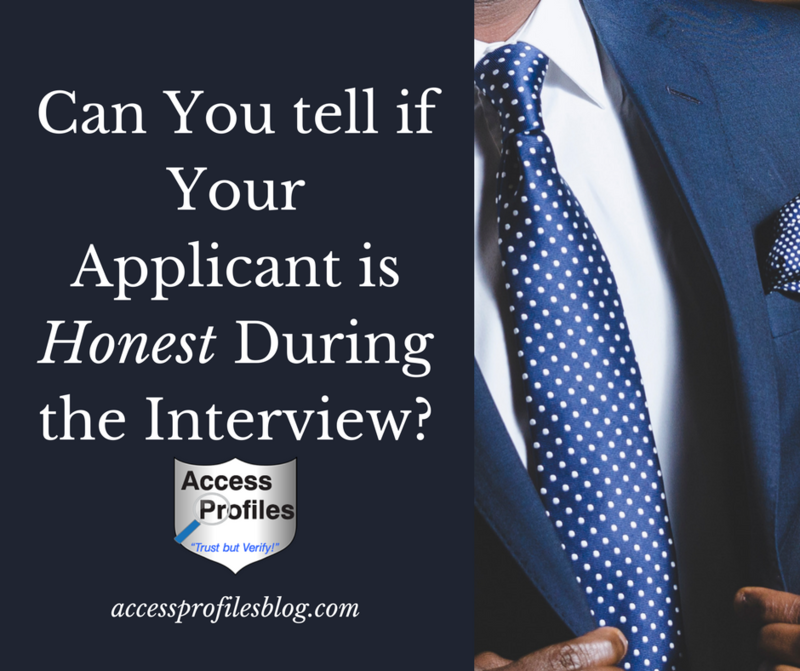 Access Profiles, Inc.: Can You Tell if your Applicant is Honest during the Interview? Can You Tell if your Applicant is Honest during the Interview? How can you check the integrity and honesty of a candidate in an interview? This question was posed recently on a popular Q&A site and the goal makes sense. Knowing whether your applicant is honest can go a long way towards helping you make a successful hiring decision. But can that goal be accomplished during the interview? "Do a Background Check! 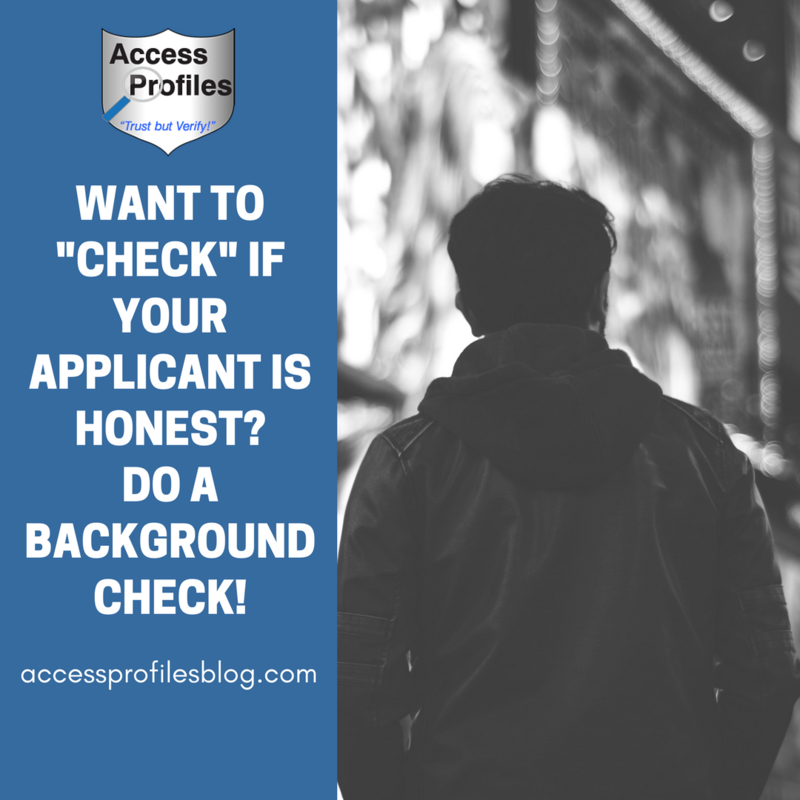 While it is important to first wait until a conditional offer of employment has been made, the employment background check is the perfect cross-reference between what a candidate told you during the interview and stated on their resume and the truth. Honest candidates will be as exact as possible in their dates and title of employment, their degree and certifications, and any other information they list. You can also check with past supervisors concerning any job duties or projects mentioned by your candidate. Verifying this information can go a long way towards checking on the integrity and honesty of anyone who applies for employment with your company!". You can check out more answers to this question here! As often comes with hindsight, I realize that my answer to that question should have included so much more! Verifying an applicant’s honesty solely during the interview is unrealistic. While it is certainly possible to gauge things like eye contact, consistency, and general demeanor, relying on the interview to determine your applicant’s honesty simply doesn’t make sense. That is where the employment background check comes in! Employers want honest employees. They want to hire people they can trust. Who will act with integrity. Who are true to their word. And if an applicant is willing to lie on their resume or during the interview, it certainly doesn’t bode well for how they will conduct themselves if they are hired! “Lying on your resume is seen as a mark against your honesty. Employers want to hire someone they can trust. If their first impression of you is one of deception, then your chances of getting hired are slim. In fact, according to the Careerbuilder survey, 51% of employers would automatically reject a candidate that lied”. Simply put, “Employers don’t hire liars. 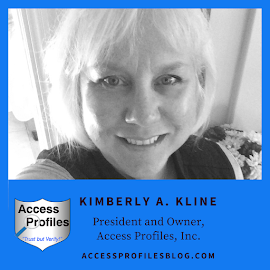 By the time a background check is ordered, they have already invested time and money in advertising their open position, wading through resumes received, and interviewing any promising candidates. Finding out that you lied at this point in the hiring process is maddening. And despite the aggravation, most are willing to start over before hiring someone they can’t trust”. excerpts from “Employers Share ~ Lie on Your Resume and You Lose!”. When applicants lie on their resume or application, there are very real consequences for the employer in the form of time and money! “It is estimated that resume fraud costs employers approximately $600 Billion annually”! Yes that is $600 BILLION! This figure covers the increased time needed to screen resumes…..40% of HR professionals say that because of the prevalence of lies, they are now spending more time than ever to verify applicant’s claims. There is also the high cost associated with hiring, training, and replacing employees that are later found out to lack the skills or education necessary to do the job. It is estimated that this can cost more than that employee’s yearly salary. And this can hit small businesses especially hard. Many struggle to cover the time and money wasted. In addition to the money spent on screening, fabricated resumes can also present very real and serious legal issues to employers. If your company hires someone who is not fit for the job, whether that is because they are unqualified or unsafe, it opens you up to negligent hiring lawsuits. It becomes even more serious if someone is harmed due to that hire - whether that is another employee or a customer". Find out more about the problems businesses face when their hires lie on their resumes in “The High Cost of Resume Lies”! There is no doubt that hiring an honest employee is a goal for any company. And if there existed a crystal ball, magic potion, or some invention to ensure that, everything would be wonderful. 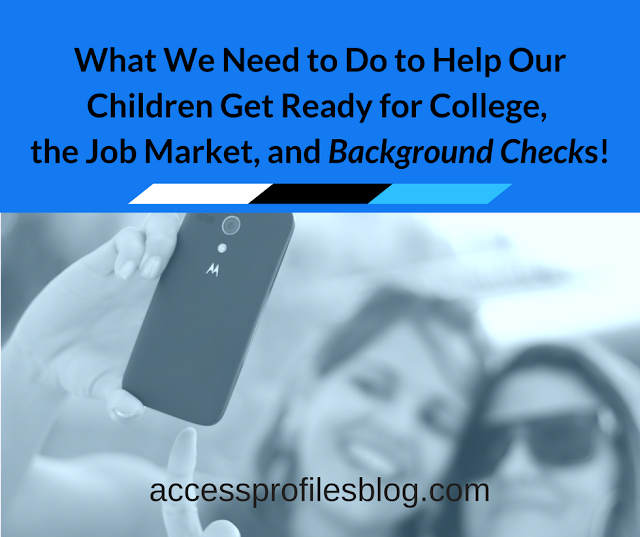 But since that won’t happen any time soon, using a good background check to hire is invaluable! It is the best tool available to verify that your applicant is telling the truth from the beginning…..something that can not be determined through the interview alone! Hiring? Contact Us Today to find out how our Background Investigation services can Help You! Discover more About Us and our Business Mentoring and Security Consulting services too! Why Do You Believe in What You Sell?